How toy stores are finding profits in big formats? Over the years, there has been a growing demand for apparels and toys for both infants and kids in India. According to Novonous, the child care market is poised to grow at a CAGR of 13.66 per cent in the coming years, owing to strong demand for baby and children apparel, footwear, toys and baby cosmetics. The annual spend on toys in India compared to the rest of the world is as low as $4-5 per child and it is set to grow substantially to reach close to $14-15 dollar per child by 2025. Similarly, the traditional toys segment targeted young children up to six years of age and constituted the highest current value share of 42 per cent in 2015, followed by a 37 per cent value share for pre-teens (population aged 7-12). This is because younger children still prefer to play with traditional toys and games, whereas they tend to incline towards video games and outdoor sports as they grow up. “TRU’s global positioning as a category leader together with its brand promise, is well-suited to bridge the need gaps in the Indian market. We do not think we need to particularly focus on differentiating ourselves from any other brand, since we have a unique attractive positioning, both, on the product and service fronts”, pointed Adeeb Ahamed, Director, Tablez. The global retail scenario is changing dramatically because they are improving and retailers are experimenting more with their store formats. They are effectively designing and managing various strategic levels to enhance the overall customer shopping experience. The problem with being known as an innovative retailer is that it can only remain innovative as long as its customers believe that the innovations are fresh and exciting. As we all know store layout is important, but if it is a small scale store, it doesn't need to be overly through like a supermarket. There should be proper sections for board games, educational type toys, books, teddy bears, active toys and electronic toys as bigger the format, clearer the differentiation. 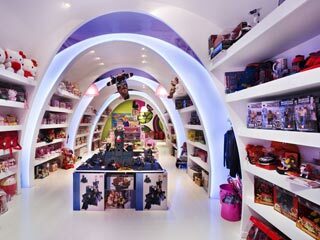 Big store format has the ability to charm the parents and children. A selection of toys should be available for play; there should be areas where children can play, so that parents can be at peace. . In the same way “Globally, close to 70-80 per cent of the overall volume (of toys) is now sold through big supermarkets—the Walmarts and Targets of the world and online. The fact that such a big volume has shifted to low-value, low-margin outlets is not good for the industry.. It squeezes the life out of it. So, on a macro level, that is a worrying trend and all of the big international brands are concerned about it. At Hamleys, we are at the other end of the spectrum. Our true point of difference is the visit to the store and the memories you take from there, of watching a demonstrator, having your kids play there, the human interaction that you experience in a store, the Internet cannot offer any of that. We are very well equipped to be successful in retail. Our competitors, who may have a supermarket of toys, a big shed out of town, but no experience, will find it very difficult to survive in a world where the Internet takes over. We do sell online through our own site in few markets and also use Amazon and other platforms. In the UK, online sales account for less than 5 per cent of total revenue”, shared Gudjon Reynisson, Chief Executive Officer, Hamleys of London Ltd to a newspaper. The big format retailing will allow infants and kid products to reach out to a larger audience and Indian consumers have welcomed this move as well. Kinderdreams from Germany plans to expand its reach across section of cities in next two years. S. Sampath Kumar, Founder and Managing Director of Kinderdreams said, "We plan to have our presence in major metros like Delhi, Mumbai and Kolkata by FY-2014-15, and in tier II cities like Pune, Jaipur, Ahmedabad and others by FY 2015-16." The company also stated that its distribution model includes four channels- distributors, large format retailers (LFR) or modern trade; company owned company operated (COCO) stores and franchises, and online retailers. Funskool has large format retail stores in metros battling high rentals and expanding its presence to tier 2 cities with own retail stores. “We are looking at opening more stores. Currently, we have 18 stores including an exclusive LEGO store in Chennai and hope to open 50 stores in place within the next three years. We will continue to target a mix of larger cities and tier 2 towns”, said John Baby.